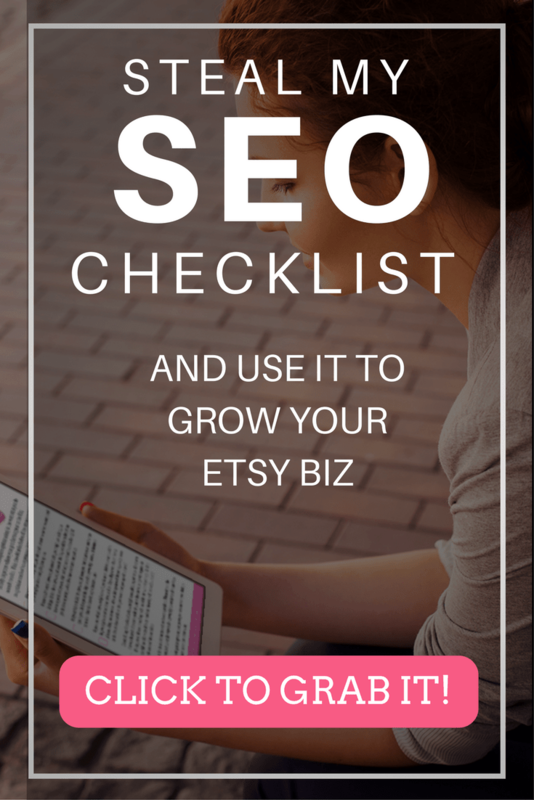 Are you ready to take your Etsy biz to the next level? Have you ever struggled with slow sales? Did you just come out with a new product line, and are at a loss for how to promote it? Then this blog post is definitely for you. If you’re in this for the long haul, and not just the short term ride, then you’re going to want an email list. And here’s why. I hear this question a lot, “But Jami, what if I’m not ready to start sending emails right away?” Or, “I don’t know what to send out!” Go ahead and start the list, and begin collecting emails from people anyway. That way when you’re ready to send your first email, you have an engaged audience. Done is better than perfect, and trying to get your ducks in a row before you send out that first email will cause you to stall out, and you won’t ever get started. A good place to start with creating your email list is with a service called Mailchimp. Mailchimp is free for up to 2,000 subscribers, and you really can’t beat free! 2. Because you own it! I’m a huge fan of social media. Instagram in particular. But the problem with using these for your marketing platform, is that anything could happen to them. They could shut down tomorrow, and you’d lose your audience. You are not guaranteed a spot on their site indefinitely, and then you’d really be out of luck. But with an email list, these people are yours forever (unless they unsubscribe) and you are able to market to them anytime you want. Your email list subscribers are there for the duration and that’s what you want! It’s tough to get people onto an email list these days because there’s so much spam out there. Everyone and their dog is trying to send us an email and it can get overwhelming. So if someone opts in to yours, it means they’re a true fan! They’ll be honestly interested in what you have to offer. Some might follow you on social media, or comment on posts, or share a pin now and then, but that doesn’t make them a true fan. Opting in to your email list means they are really invested. These people are ready to see what you have to say, and you can market to in their inbox. This way, you have a better chance of getting them to know, like and trust you. 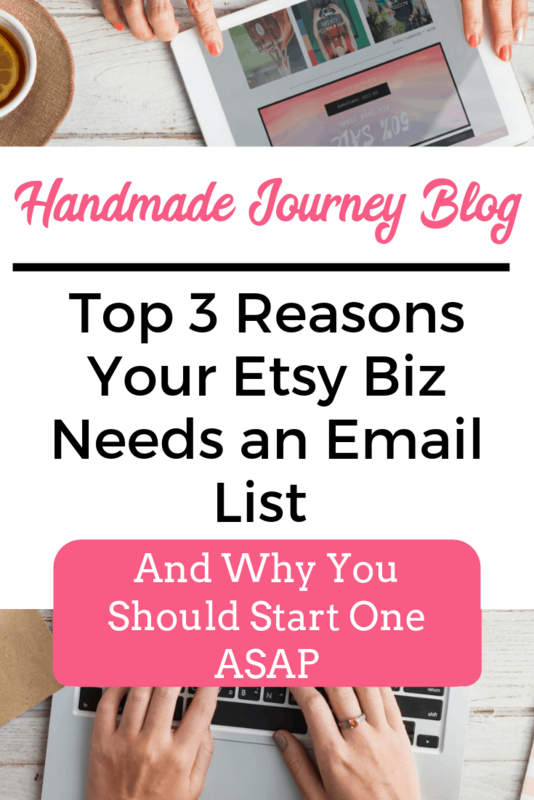 These tips are just three reasons why I believe it’s so important to start an email list for your biz right away! It can take some time to get people onto your list, and you definitley have to apply patience. However done correctly and given enough time, an email list can be such a powerful tool to have in your arsenal. Taking the time to perfect your Pinterest profile is crucial to becoming profitable with Pinterest. You want people to find you on Pinterest, to understand what your business is all about, and ultimately visit your website or join your email list. 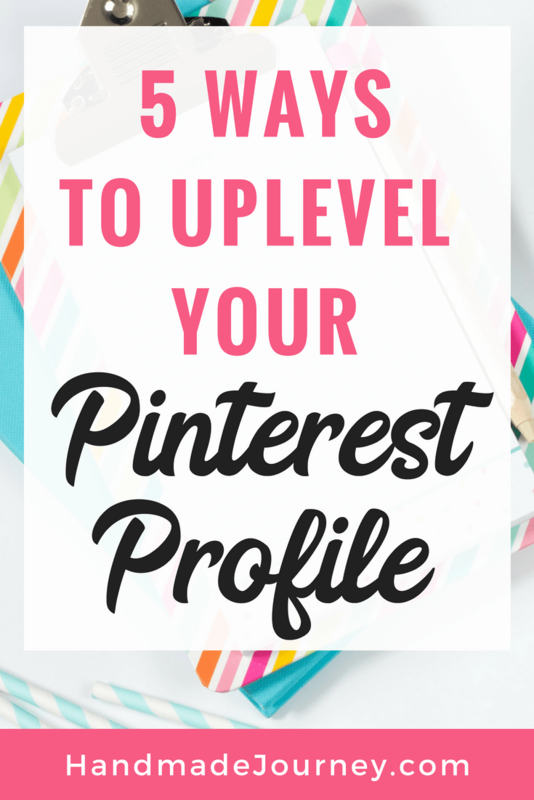 Read on to learn 5 ways to uplevel your Pinterest profile. The Business Name field inside your Pinterest profile can hold up to 30 characters. Most people just put their short and sweet name here but I recommend making the most of it by including a little bit about what you do as well. This is helpful because your account will appear in the Pinterest search if anyone uses the words you’ve added to your business name when searching Pinterest. This can help you gain highly targeted followers. In the photo below you’ll see I have close to 100 characters. Since this screenshot was taken you can no longer make your title larger than 30 characters. Still try to use as much of the space as you can and fit in a keyword or two if space allows. I see lots of people adding snapshots of themselves or a photo of the product they sell as their profile photo on Pinterest. These types of photos don’t help put your best foot forward though. Instead I recommend a professional photo of your smiling face which helps people connect with your or I recommend adding your logo. Going with one of these options will help show that you’re a professional business on Pinterest and will help give you a better level of expertise. If you go with your logo make sure the look and color are similar to everywhere else your brand is represented online. This will help build brand recognition as people find you across social media and your website. This one seems like a no-brainer but I often see people forget to add their website to their profile. Make sure people have a way to find out more about you. If you haven’t yet, make sure to purchase your custom URL and use that like I’ve done in the Handmade Journey profile with handmadejourney.com. A custom URL helps brand your business and looks more professional than say an Etsy URL or a wordpress.com URL. You can redirect the custom URL wherever you like. Just make sure you’re sending people to your main online presence. When you go to write your description make sure you tell your customer how your business will benefit them in the first part. Whether you sell a product or a service you are helping people. But you’ve gotta be really concise because you can only fit 160 characters in the description. Tell people who you help and what you help them with. For my Handmade Journey description I say “Helping Etsy sellers turn their craftiness into sales”. It tells people really quickly who I help and what I can help them with. In the second part of your description you want to include a freebie to try to get people who see your profile onto your mailing list. I include a little bit about what the freebie is and a link to the freebie. The link won’t be clickable so I try to make it as short as possible. You can use bit.ly if needed to help make the link shorter. In my Handmade Journey profile I’m giving my followers a PDF guide but you can get creative here. Some examples of what you can create as a freebie are printables, checklists, discount coupon codes, how-to guides, free gifts with purchase, etc. The ultimate goal is to get people off of Pinterest and onto your email list so you can market to them in the future so definitely don’t skip this step. Access your full “Profitable Pinning” course in the Handmade Journey Academy. You’ll learn strategies for growing a following, creating tall pins, writing pin descriptions to get you found in the search results, joining group boards, and automating your entire strategy for sales on auto-pilot. 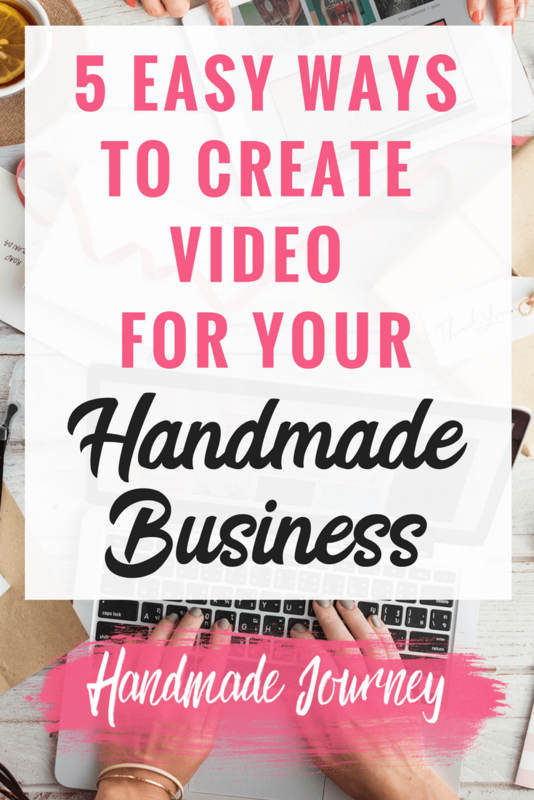 Creating video for your handmade business can seem super scary. The first time I made a video, my hands got all sweaty and I had to do probably 100 takes before I felt it was worthy of being shared. 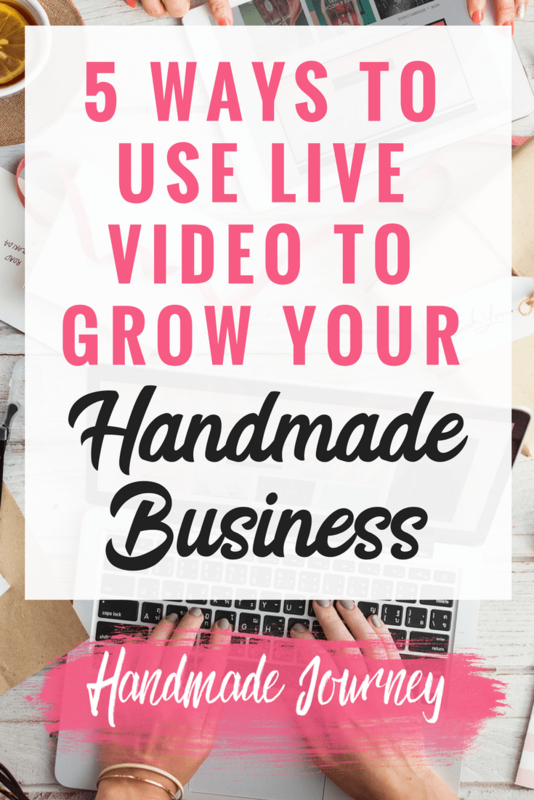 But as I mentioned in my last blog post 5 Ways To Use Live Video To Grow Your Handmade Business, using video for your handmade business is going to be an important part of your social media strategy in 2018. Read on to learn 5 easy ways to use video (that aren’t super scary)! I love watching Instagram videos where someone speeds up their production process. Did you know those videos are really easy to do? With your cell phone, a tripod, and a nifty app called Hyperlapse- you can take videos as you are creating products and with the Hyperlapse app (iTunes), speed them up and post them not only on Instagram but Facebook as well! And you don’t have to show your face or speak so it’s a low anxiety way to get started with video. If you’re on Android a good alternative is your phone’s native hyperlapse feature (if you have a newer Samsung) or the Microsoft Hyperlapse app (Android). If you are worried about showing too much of your process, that’s okay. You can record yourself packaging orders or even just record a small part of the process. You don’t have to give away any secrets. Keep these short and show just enough to draw people into the video. Do you make something using glitter, or a material that is really hard to catch its true beauty in photos? A video is a great way to show the details that photography is hard to capture. Again- you can accomplish this with your phone, and an app called Boomerang (iTunes or Android). Boomerang is an app from Instagram that takes a burst of photos or a video and stitches them together into a high-quality mini video that plays forward and backward. Lets say you make decals with glitter vinyl- you could record a short video of you turning that decals different direction in the light to catch the reflection of the glitter. Bommerang will than speed that up into a short video that plays backwards and forwards. There are all kinds of fun ways you can use it to show off your products! I know, I know… you’re likely thinking “But my workspace doesn’t look like it came out of an IKEA catalog! I work at my dining room table”. That’s okay! People love to know the person or place behind a product. You don’t have to show off all of your workspace either. Don’t want to hear yourself on video? You don’t need to say anything if you don’t want to. Just pan around your space and post! Side note- did you know you can turn the sound off videos on Instagram? So don’t worry if your dog is barking in the background, or your toddler comes running in while you are recording it- you can still post it, and just turn off the sound. This tip doesn’t even require you to take a video at all! All you need is photos of your products and any collage video app. My go to app is FilmoraGo (iTunes or Android). I just upload photos of my items, add some cool effects, some music if I’d like and I have a professional looking video of my items I can post. These types of videos are great to do for holidays and special occassions- so create different collage videos that showcase your seasonal products together. I am pushing my Handmade Journey Academy members this year to really take a step outside of their comfort zone. Putting yourself in front of the camera may be really far outside of yours. As I said- it was really scary at first for me, and sometimes still is! But again, all you need is your phone and a tripod. I challenge you to record a quick 30 second video introducing yourself to your audience. Share a little bit about yourself and why you started the handmade journey that you’re on. You’ll be surprised at how much your audience loves connecting with you in this way. In my 2018 Handmade Seller Predictions Guide, I shared how live video is going to be huge on social media this year. With the Facebook Algorithm changing (again!) and Instagram showing less of your posts to your followers, live video is an amazing way to hack the algorithms and connect with your followers. Its easy to see why- 80% of people would rather watch live video from a brand than read a blog, and 82% prefer live video from a brand to social posts. (Source: Livestream and New York Magazine Survey) Here I’m sharing 5 ways to use live video (on Facebook or Instagram) to grow your handmade business! Did you know that 4X as many consumers would rather watch a video about a product than read about it? That tells us that video- not just Facebook or Instagram Live- is a great way to connect to your audience. Especially in the handmade market where customers want to get to know the person behind the business! And there are so many ways to connect with your audience using video. Share a quick video about why you started your handmade business or to tell a little bit about yourself. Tell your audience why you fell in love with the products you make and why you’re so passionate about your business. Have seasonal items you don’t want to hang on to until next year? Items that have slight flaws that you don’t want to sell at full price? These are both great products to offer during a Live Sale. During a Facebook or Instagram Live you can show off your items by hosting a live sale. Encourage your viewers to share the video with their friends. You could even offer viewers a discount on their purchase if they share the video. This is a great way to get in front of new buyers. Coming out with a new product line? Or maybe just one new item? Live video is a great way to share your new products, give a demonstration on how to use them, or share your inspiration for your new line or product. You can answer any questions your followers have about the new items or show them sneak peeks of what’s coming. You can even include your customers in the creation process by asking for their opinion on colors, materials, or product ideas. You can also use l video to give followers a behind-the-scenes look at your business and how you work. Share your processes, your work space, your materials, etc. You might also focus on an aspect of your business that your target audience would be interested in learning more about. To you, this info may not seem entertaining but we love to take a peek into other people’s lives and businesses. If you’re not comfortable using live video just yet, try creating a hyperlapse video (sped up video) showing you crafting. You don’t have to show your face either. Just show your hands making the product. Customer service is an important part of any business. Chances are, you answer every question that comes in, even if it’s a repeat question. While it’s important that you respond to every question, this can eat up a lot of time. Fortunately, this is an area where live video can be useful. For example, you might identify a common question that you receive, and rather than answer the question again and again, you can have a Facebook Live video session to answer it. Its also a great time to see what other questions your followers may have about your products. You can link to this video next time someone else has the same question. Etsy product descriptions are often one of the most overlooked parts of a listing. The text that you include in your descriptions can be one of the biggest determining factors over whether your shoppers click Add to Cart. 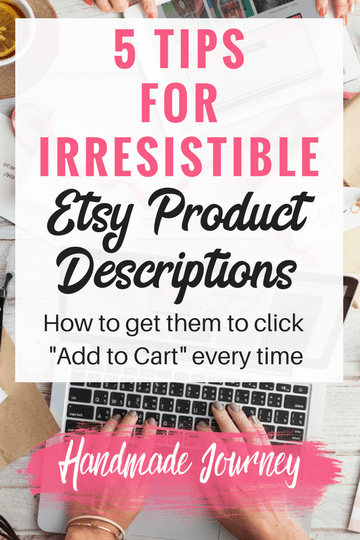 These 5 tips will give you all the tools you need in order to write irresistible Etsy product descriptions! Sectioning off your Etsy product descriptions keeps them easy to scan through. Most Etsy customers are browsing Etsy and looking at tons of listings at once to make a decision on what to buy. If your product descriptions are in one huge paragraph, the buyer will feel overwhelmed and not want to read it so keep paragraphs to 2-3 sentences max. Adding titles to your sections of your descriptions makes it easy for customers to zero in on the information they need. Use titles such as: Size, Processing Time, Customization throughout your description. You can add bullet points or put these titles in all caps so that they stand out and are easy to spot. One thing to remember is that a confused buyer will move on. If a buyer is left with lingering questions, most buyers aren’t going to bother reaching out to you to ask for more info. Make sure you answer as many questions as possible that any potential buyer may have. If it’s a shirt, is it true to size? Is it unisex or woman’s fit? If its a sign, what are the dimensions? If it’s a headband, what size head will it fit? What materials were used in your products? What’s your processing and shipping time-frame? Answer these common questions in a clear and concise way. A call to action is important because it’s where you ask your buyer to do something else. A great call to action to add to your Etsy shop is to encourage buyers to keep browsing the rest of your items in your shop. Add your call to action at the bottom of your description. In my own shop I put something like this at the end of each product description: “Be sure to check out the rest of my rustic wood signs:”. This tip falls right in line with the call to action tip. Right below your call to action add in the link to your Etsy shop. Because it’s an Etsy link this will be clickable and will encourage buyers to check out the rest of your listings. The longer you can keep someone in YOUR shop, the more likely they are to buy YOUR products! This is the most crucial tip! If you do nothing else, use this tip! If you had a brick and mortar store you’d be able to talk up your products to your customers. Unfortunately you can’t do that on Etsy but a sales pitch paragraph at the top of your products is the next best thing. This helps people envision the products in their life or helps them determine who the product would be a good gift for. It’s also a way to naturally sprinkle in some of your keyword phrases which Google loves. To help you write your sales pitch I’m sharing an exclusive template where you just need to drop in the words to quickly create a sales pitch for each of your listings. You’ll get a printable version too! I’ve also shared a few examples to help you visualize how to use the template. Click here to grab a printable PDF version of the sales pitch template or check it out below! This (product name) that (describe a feature of the product) is the perfect (another word for what the product is) to (what is it used for?). This also makes a great gift for (who would it make a good gift for?). It would look great (where can you put this particular item?). Example 1: This red keyhole scarf that includes woven glitter yarn is the perfect gift for the mom in your life. This also makes a great gift for a friend who needs to stay warm. It would look great accessorizing your fall outfits as well. Example 2: This rustic wood sign that says Uncork & Unwind is the perfect wall decor to show off your love of wine. This also makes a great gift for wine loving friends and family. It would look great hanging in your farmhouse style kitchen or above your wine bar. Example 3: This blue and yellow baby blanket that can be personalized with your child’s name is the perfect bedding to accessorize your baby’s crib. This blanket also makes a great gift for new moms looking to personalize their baby’s room. It would look great thrown over the side of a crib or even hanging on the wall.